My fall sewing plan is slowly taking shape in my head. I have thought about what I wear, how I wear things, and what feels comfortable. It dawned on me that I usually prefer a dark inner column (black or dark gray dress) with a cardigan in a lighter color (which will be lime green this season). With pants (almost always black), I wear a black top with a light-colored cardigan or a light-colored top with a black cardigan. Clearly, taking pictures next to the window is not my strength – the colors come out odd. But you get the idea, yes? That should be enough to get things rolling. I’m off to the sewing room. Happy Labor Day (or regular sewing Monday)! I just love your color palette. I want to make a lime green coat, but it’s just not in the cards this year. Oh well! Have fun sewing. Rhonda, thank you. 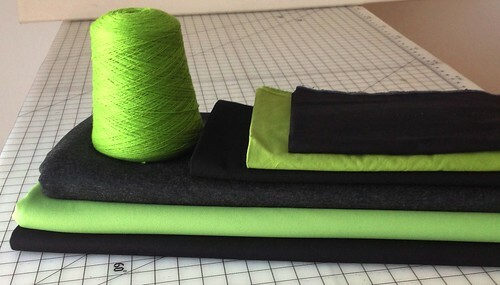 A lime green coat is on my wish list too, but I haven’t been able to find the right fabric. This will be sooo pretty when completed. Especially the gray/lime combo because it’s unexpected. I think you will enjoy sewing this combo.